The Capital City Men’s Chorus presents their 29th annual holiday concert, TRADITIONS. Featuring special guest performer, Cathie Sheridan. Traditions…they’re what the holiday season is all about. Remembrances, from days gone by, when folks would come together to celebrate the season and enjoy the fellowship of family and friends! Allow the men of the Capital City Men’s Chorus to transport you back to those carefree days, when you would peek over the table to get a glimpse of a perfectly browned turkey, fresh from the oven. Or, to see for the first time, the sights and sounds as the whole community comes alive with lights and music. Sneaking in to pick up a present, give it a little shake and wonder what’s inside! The soft lights of the Hanukiot- the Chanukah menorah, flickering across the room. Going to those holiday parties, or your favorite house of worship, to commune and celebrate with others in your neighborhood, some of whom you haven’t seen since last holiday! Come along with the CCMC, accompanied by our orchestra of strings and harp, as we take you back to yesteryear with some familiar old songs, who, like very old friends, only improve with time and age! Songs like the ever-popular Sleigh Ride, Carol of the Bells, and many others, will get your toes tapping and put a smile on your face. Lorten Lauridsen’s beautiful anthem, Sure on this Shining Night, a poem about lasting friendships and chosen families is sure to move you like nothing you’ve ever heard before. If that’s not enough, the gorgeous, soaring sounds of the dual-choir selection of O beatum et sacrosanctum diem, is sure to imbue a sense of the holiday spirit that will last you through the New Year! As always, there will be a few surprises on stage to further entertain and delight. And, always a crowd favorite, our audience sing-a- long, where you get to join with the chorus and sing some cherished holiday melodies! 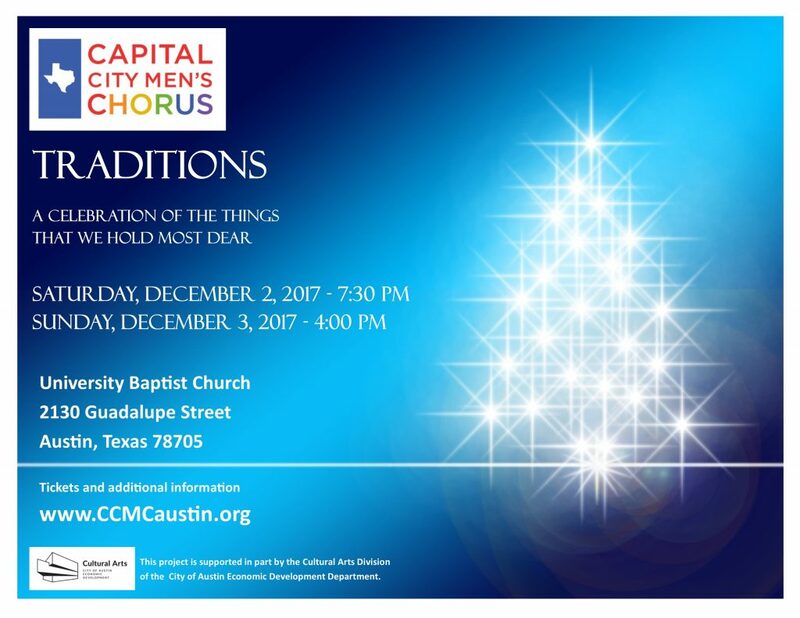 Please plan to attend this special, family-friendly performance and include the Capital City Men’s Chorus in your holiday Traditions! University Baptist Church, 2130 Guadalupe St, Austin, TX 78705.